Battaglia Roofing has a solid long-standing reputation for delivering on its promise of client satisfaction and high-quality roofing services at fair pricing for New Jersey. Having serviced the Northern New Jersey market for more than 50 years, our second going on third generation family owned business has stood the test of time, just as our roofing systems continue to do. Established in 1956 by Michael Battaglia Jr., the company at first focused on residential roofing systems only servicing small and medium sized home owners. However, as opportunity grew in the commercial and industrial segments we seized it by rolling out built-up systems services for small businesses. In the mid-1980s, John Battaglia (current owner and operator), again recognized changes in the roofing market and moved to build capabilities in delivery of modified bitumen systems to meet changing customer demands. 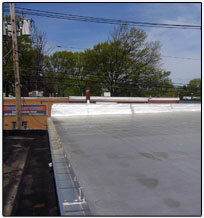 Today, Battaglia Roofing provides one ply and modified systems to a long list of small and medium-sized businesses. Battaglia Roofing continues to provide the above services to a variety of clients in New Jersey. We would be happy to provide client references upon request. In fact, many of our current clients have been with us for decades. The book of business built by Michael over the initial years of the company has been maintained and expanded by John. Other multi-generational businesses in New Jersey have stayed with Battaglia Roofing Co. for the life of their own family businesses as we have continued to provide superior quality service at the right price, and with a unique touch. Again, with changes in roofing systems and technologies, Battaglia Roofing Co. has adjusted to meet the needs of our customers in New Jersey, thus maximizing roofing systems performance for our clients. However, unchanged throughout the course of our business transformation have been the simple, key and constant staple characteristics of doing business with us: reliability, quality, client satisfaction, and competitive pricing. We hope to partner with you to deliver these qualities in our work.